Discussion in 'Stock Market Today' started by bigbear0083, Mar 15, 2019. 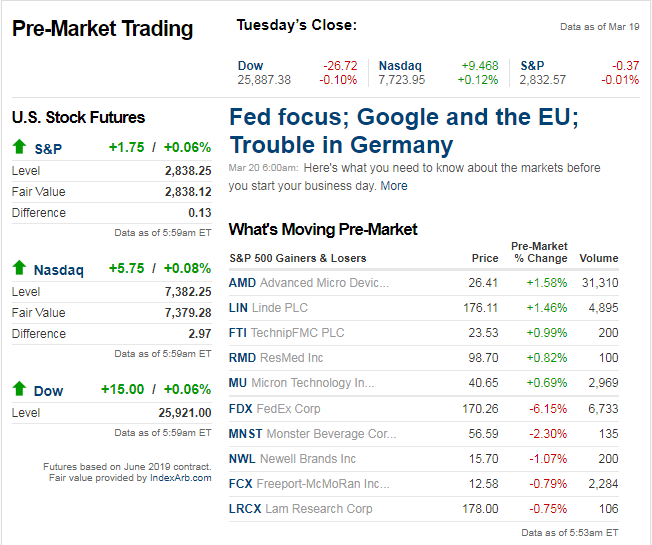 It is a very positive tone for European equities and US futures this morning as the S&P 500 is indicated to open up half of one percent as it continues to follow through from Friday’s close above resistance. There’s not a lot of economic data to speak of today, but the FOMC is set to begin a two-day meeting. With virtually zero chance of a hike or even a cut in rates at this meeting or in the next few, they may have trouble finding things to talk about for the next two days! With the S&P 500 down just over 3% from its all-time high and tomorrow marking the six-month anniversary since the last time the index closed at an all-time high, the current period is just the fifth time since the March 2009 low that the index has gone six months or more without closing at post-financial crisis high. It also marks just the sixth time that the index has gone more than 100 trading days without hitting a new high. 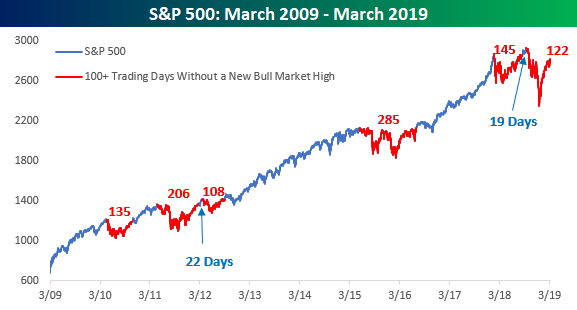 In the chart below, we highlight the S&P 500’s path since the March 2009 lows and show each of the 100+ trading day droughts without a new high in red. The current period, which will extend to 122 trading days today, has been unique as it came just 19 trading days after a 145 trading day drought that spanned late January to August of 2018. When the S&P 500 finally broke out to new highs last August, bulls were probably not expecting such a ‘lame’ breakout as the difference between the September high and the high from earlier in January was barely more than 2%. The only period that was similar was from 2011 through 2012 where a 206 trading day streak without a new high and a 108-day streak were separated by just 22 trading days and a rally of less than 4%. Those two examples just mentioned are where the S&P 500 saw the smallest rallies following a drought of 100+ trading days without a new high. The other three periods, however, were a lot more palatable for bulls as the S&P 500 rallied an additional 12% through May 2011 after breaking the 135-day drought in November 2010, an additional 50% through May 2015 after breaking the 108-day drought in September 2012, and an additional 33% through January 2018 after breaking the 285 trading day drought in July 2016. The S&P 500’s gain of 1.55% on the January 30th Fed Day ended a streak of 18 consecutive Fed Days without a 1%+ gain for the index. 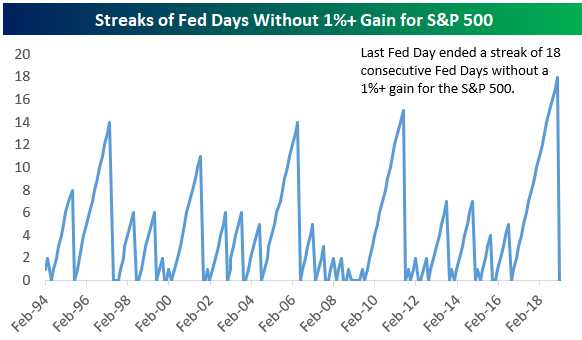 The gain also ended a 7 Fed Day streak of declines for the S&P 500 dating back to the start of Chair Powell’s tenure. Both streaks were the longest on record dating back to 1994 when the Fed began announcing its policy decisions on the same day as its meeting. Good Wednesday morning to all. Not a lot going on in US markets with respect to headlines (besides FedEx’s big earnings disappointment) ahead of this afternoon’s FOMC meeting where the committee is also expected to do nothing. Whenever we find ourselves in these types of “not a lot going on” situations, though, the market always finds a way to surprise everyone, so we’ll watch and wait. As noted in this morning’s report, data released by the Semiconductor Industry Association showed the fastest decline in global semiconductor sales on a 3m/3m basis since April of 2009. The 20% annualized rate of decline for nominal semis sales is consistent with global manufacturing PMI around 49 (versus 50.6 in February data). Declines are broad across various regions. 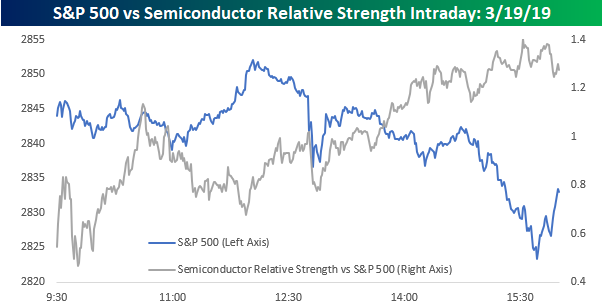 While sales rates have been in decline, the rebound in semi stocks has been anything but “semi.” We’ve been highlighting the relative strength of a sector frequently, and most recently in last week’s Bespoke Report, but even yesterday when the market started to sell off in the afternoon (blue line), semiconductor stocks held up very well as evidenced by the rising relative strength versus the S&P 500 (gray line). Dow Transports down more than 1% each of the last two days. Firm rejection at 200 ma. Transports and Retail below all (20,50,200) moving averages. FED coming up, are we in for a letdown when almost everyone thinks the FED will be dovish? “Marlboro Friday” refers to a day back in 1993 when Philip Morris announced drastic cuts in cigarette prices in order to better compete with the cheaper prices being offered by generic makers. 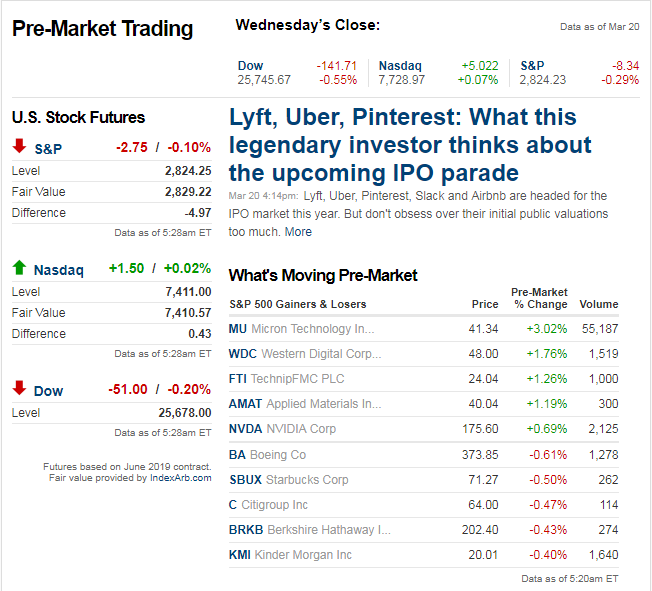 As a result of the move, the company’s stock dropped over 25% in a single day. Fast forwarding a quarter century, today could go down in the annals of history as ‘Biogen Thursday’ as the company announced that it was discontinuing trials for its experimental treatment of Alzheimer’s disease as the initial results have been ineffective. As a result of Biogen’s announcement, the stock, like Philip Morris back in 1993, is trading down over 25%. In the case of Philip Morris back in 1993, the stock did a whole lot of nothing for the next six months and took around two-years to get back to its pre-Marlboro Friday levels. BIIB shareholders are no doubt hoping that a little time will also heal the sting from today’s decline. 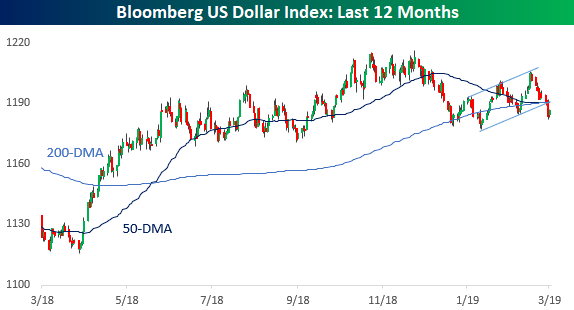 In broader market news this morning, the Bloomberg US Dollar Index is attempting to bounce following yesterday’s breakdown in the wake of the FOMC’s dovish tone. Heading into today, the index was down in eight of the prior nine sessions and just yesterday broke out of its short-term uptrend that had been in place since the FOMC started to pivot dovish late last year/early this year. Was the FOMC dovish enough this time around to really push the dollar lower? amazing! 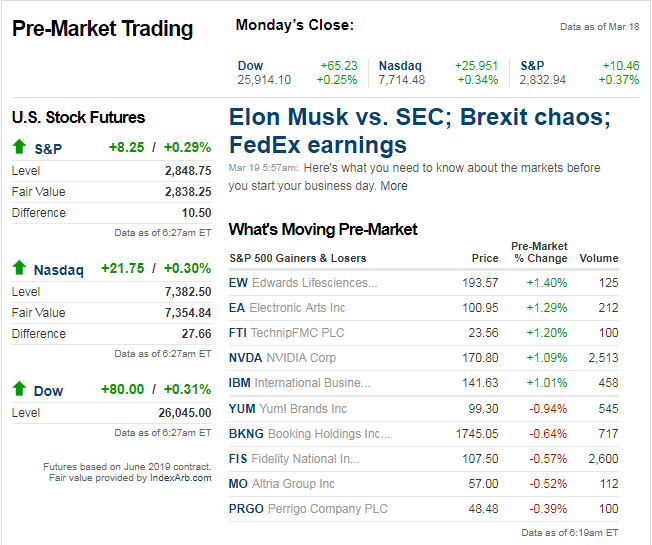 this market simply does not care about trade wars, global econ. weakness, you name it. i think you and i @stock1234 have been on this same page for a long time now in thinking that we believe the FED is and has been the MAIN driver of the markets. it almost seemed to me yesterday like the fed went FULL RETARD on its dovishness...like you couldn't get more dovish than that, outside of a straight up rate cut! Steven_Burt, Jrich and stock1234 like this. Steven_Burt and bigbear0083 like this.